This post is for a very specific audience due to a rather odd circumstance of denominational legislation within the Assemblies of God. UPDATE: Since publishing this post, I have received the memo pertaining to the policy. Since 2011, the credentials committee has observed a policy for “fast track credentialing” that previously pertained only to pastors of churches (or potentially entire denominations) that would wish to become Assemblies of God affiliated. Under this policy, ordination would require an application, references, background checks, a study of A/G history and and polity, and an interview with district officials. In August of 2014, the credentials committee asked and the General Presbytery approved for this to apply to minister’s spouses, “provided the applicant is a ministry-active spouse who is married to a minister who has been ordained for a minimum of 10 years.” Obviously, “ministry-active” is a key word here of which only the interpretation of the credentials committee can be authoritative. This is what I am relatively certain is the case: At General Council for the Assemblies of God on 8/6/2015 there was a minister (Ken Walters) that brought a “point of order” that he hoped would end a practice of ordaining spouses of those who had been ordained ministers for 10 years (the video of this minister begins at 1:50:30 here). He claimed that this violated A/G bylaws (Article VII, Section 2) that required examination for credentials. Dr. Wood, chairman of the meeting, ruled that the matter could not be discussed because it was not submitted as a resolution according to parliamentary rules and did not rise to the status of an “emergency resolution.” Dr. Wood expressed the intention of the General Presbytery to review the matter of concern. Here is what I’m learning from social media: It appears the districts have utilized this new policy very unevenly. Some districts seem to have tried to stifle such applications as much as possible, either by not communicating about the policy or by actively resisting it. Other districts apparently have sent letters to those that qualify and invited applications. Some districts apparently require an interview, others have required a written exam, others seem to be bypassing even these minimal steps according to the argument on the floor. I have only heard these explanations, but I would welcome anyone to add clarifications in the comments below. Because this is a decision of the credentials committee and General Presbytery, they could also reverse the decisions without waiting until next General Council. Rev. Dr. Jim Bradford, General Secretary, oversees this process and is the proper person to address concerns about the policy. I would encourage anyone to contact him directly. My interest in writing here is two-fold. I’d like to communicate as much and as clear of information about what is and is not happening so that A/G ministers understand the case. Rev. Bradford may decide to simply explain this policy to the fellowship in some setting. But I do not know that he has done so. As I have additional information about the policy and its implementation, I will update this page to reflect what I understand to be the case. Additionally, the comments below will serve as a place for others to speak from their own understanding what they believe to be the case. My second interest in writing is that I would like to raise awareness of this policy to the point where General Secretary Bradford and other leaders feel the need to act on the concerns. I believe that many in our fellowship will think, as I do, that ordaining persons on the basis of their spouse’s training and calling is inappropriate. If this site generates sufficient interest, I will send the comments below to Rev. Bradford. Even if this page does not generate significant comments, I hope that raising awareness about the issue will create a sense of urgency for our leaders. With that said, let me explain my own position: I do not believe our leaders had any nefarious intent in creating the policy. I’m confident that they created the policy to deal with a perceived administrative problem and nothing more. But the result is a policy that I believe undermines ordination in our fellowship by misconstruing the function of ordination or the need for it. Ordination is a designation of the body that God has called and gifted a person for the ministry of preaching and worship leadership. I don’t think anyone that I have heard have concerns about this practice wants to demean the ministry and calling of a pastor’s spouse. Pastor’s spouses spend themselves for the sake of the Gospel in many ways as they serve their communities. But if they are not called and trained as ministers of the Gospel, then they should not be ordained as a matter of courtesy or honor for their years spent in service. There is only one reason to ordain: the person has a proven calling to the ministry of preaching and worship leadership. 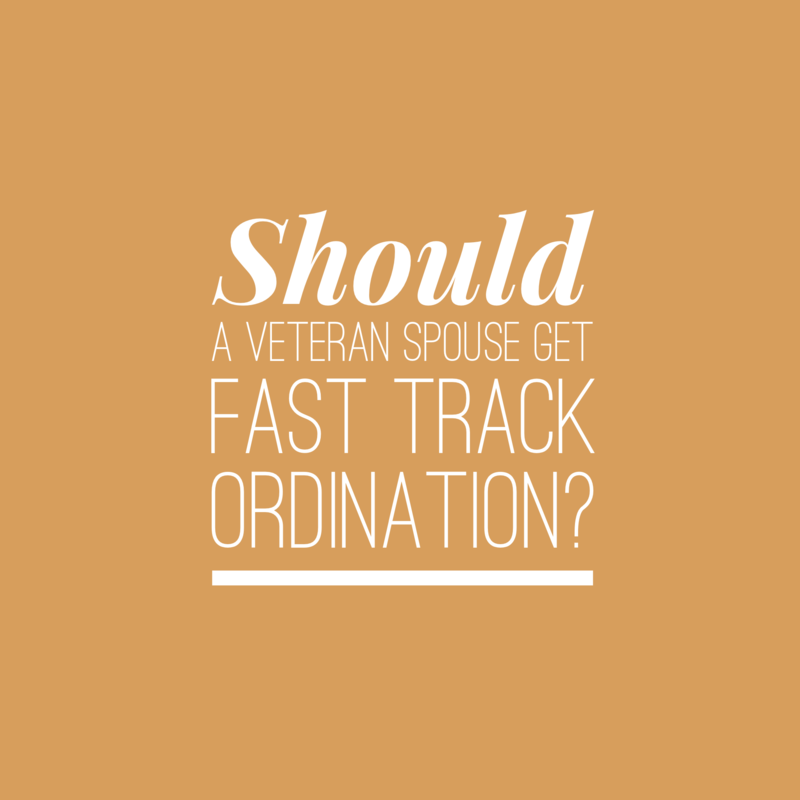 If a spouse has such a calling, they would do well to pursue ordination by all of the requirements presently required. While there may be some limited sense in which a spouse has met one or more of the educational requirements, this should be evaluated in a limited way and not broadly such as waiving all educational requirements. If you have helpful information to clarify the history or practice in question, please help me to clarify that information on this page by commenting below or messaging me through the contact page. I have no desire to raise hysteria, but to raise awareness of what is actually the case. What do you think? Why do you support or oppose this policy? I am also not a fan of this. Guys, if you want to see this change please please send a well-thought out, spell-checked, kind, intelligent letter or email to your district secretary (whoever is in charge of credentialing) and Jim Bradford in the national office. Do not rant. Do not whine. Present yourselves as meaningful contributors to this conversation but if you are serious about wanting this to change, don’t let your comments rest only in this group. Set up a meeting with your district guy and prepare well for it. If this is the case: “Ordination is a designation of the body that God has called and gifted a person for the ministry of preaching and worship leadership” – then it seems that you are arguing that ordination is a recognition of someone’s calling. If that is true, then couldn’t the experience count as a way of that recognition? I think i follow the general gist of your argument, but it seems this statement contradicts what you’re arguing – which, if i understand you, is that ordination also requires a certain amount of formal education and training. Perhaps I’m just misreading this? I am not very familiar with this policy, however, it appears to have the strong potential of being misused. Life experience and calling should be a higher standard than education alone and yet we have set guidelines for AG credentials. Bending rules for select individuals is favortism. That being said if the policy is clear as to the qualifications of a candidate then those guidelines should be equitable and universally adhered to. I think you need to edit and spell check your blog posts.